i first heard of florence when i was about 8 years old in what is arguably one of the most underrated rom-coms of all time, while you were sleeping (seriously, look it up if you haven't seen it). i won't spoil the movie, but she refers to florence as this far-off, amazing place worthy of a passport stamp. so because the movies told me to, firenze was a non-negotiable stop in our trip come planning time. what we immediately figured out is that florence is a MUCH different city than rome. sure, you still have to fight your way through throngs of camera-wielding tourists from time to time. but the city center seems a lot smaller and more manageable than the vast spread of roman monuments. take, for example, the loggia dei lanzi, an open museum that houses a handful of different sculptures. it's free to walk through and is right around the corner from the uffizi gallery. there are differing opinions about the uffizi, but ultimately I would suggest this: if you don't love art, like really, really love it, skip it. seeing david would be an amazing experience, but there are life-size replicas of him all over the city. also, we made a mistake in florence and we'll be the first to admit it. instead of finding a cool airbnb in the heart of the city, we used points on a hotel a little way outside of town. nothing against the hotel itself, but as we walked around and saw all things florence, we wished we were closer to the action. but! live, learn and never stay in a lame location again. see what I mean? the man is everywhere! 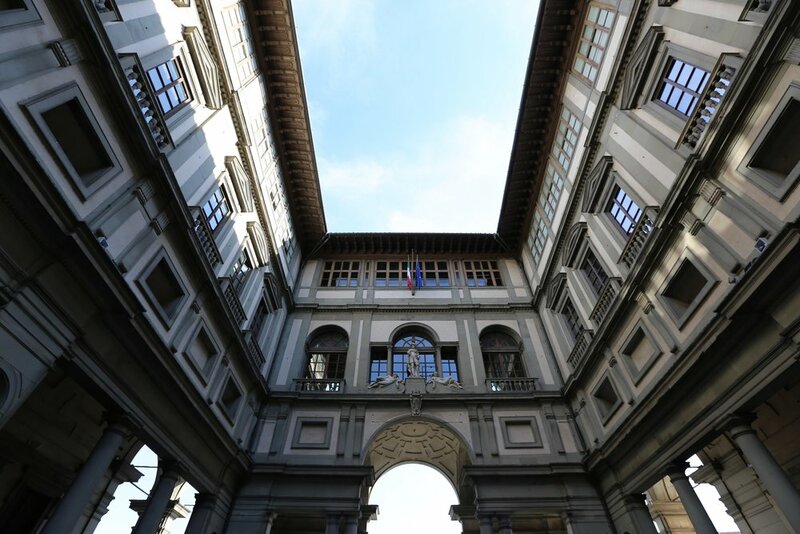 the outside of the beautiful uffizi gallery. swooooooooon. the major focal point of florence is the duomo (or florence cathedral for those translator sticklers out there). it's absolutely monstrous, but intentionally empty and open once you're inside. because simply walking inside wasn't enough and since we felt like climbing 400-some stairs (ha! ), we decided to climb the duomo too. the climb is narrow, steep and not for the faint of heart, but the views are freakin' amazing. 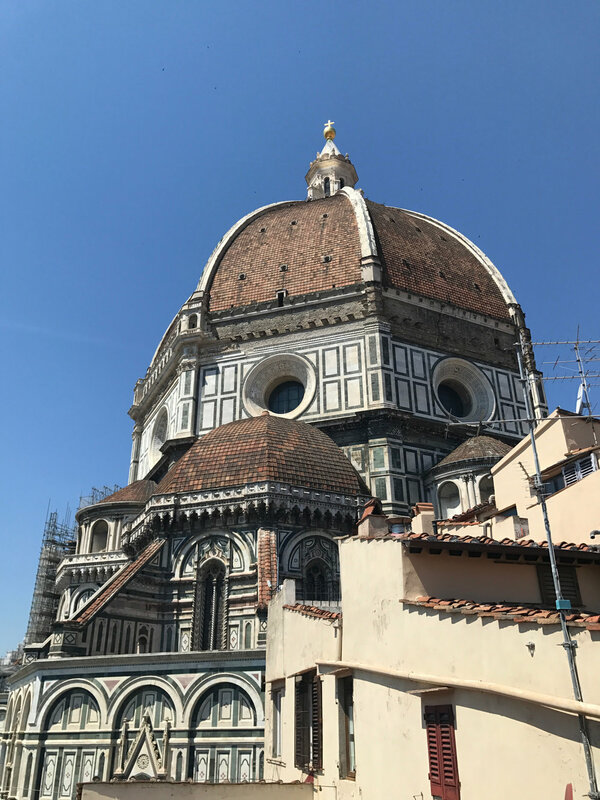 and if you're in the area and have some extra time, don't sleep on the museo deII'Opera del duomo which explains how the duomo was built, the religious significance of it and why it's still important to visit while in florence. if museums aren't your jam, definitely go inside the duomo at the very least and see how expansive and amazing the cathedral is on the inside. the duomo from the outside. everything the about the architecture and style of buildings and cathedrals in florence is so much different than anywhere we've been! the duomo ceiling. can youuuuuuu even imagine painting this way back when? incredible. this is toward the top of climb whilst inside. you get such a closer view of the dome. view from the top with this cutie! also within the duomo 'complex' is the baptistry of st. john, a smaller but still stunning chapel with gold accents FOR DAYS. seriously. it's nearly blinding. but nonetheless, it makes for some amazing photos and lighting when the sun hits it just right. i could walk around the side streets of italy all day, every day. you never know what you might come across down a random alley. 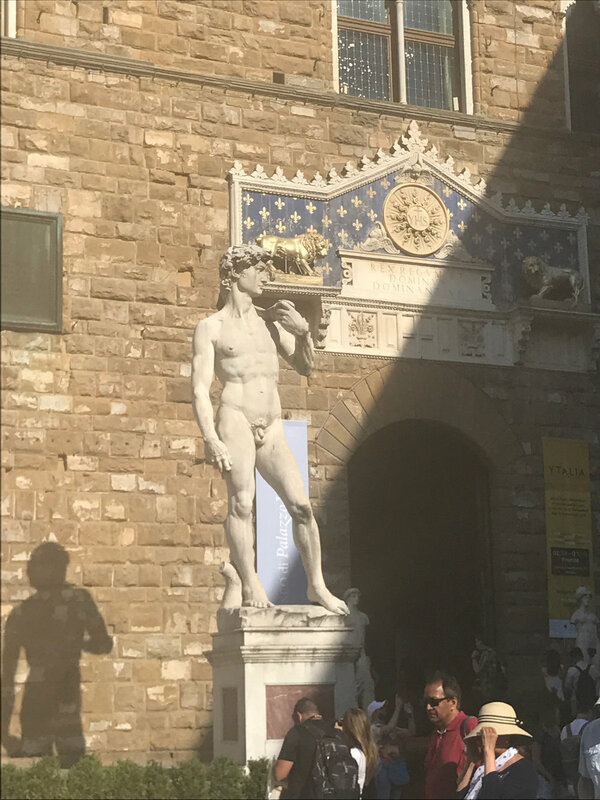 while the duomo and uffizi are super popular spots, there is so much more to see in florence than what is immediately advertised. as we do and recommend in every city, walking around can lead to so many surprises - and of course, good stuff to eat & drink too. florence is certainly no exception. ponte vecchio used to have all kinds of shops and vendors overlooking the arno. now though, it's one fine jewelry shop after another plus some lookout points for that primo selfie. if you eat at just two places in florence, make them all'antico vinaio and gusta pizza. we had multiple friends suggest both places and knew we had to check them out. the former is a street food-type sandwich shop with take away wine. 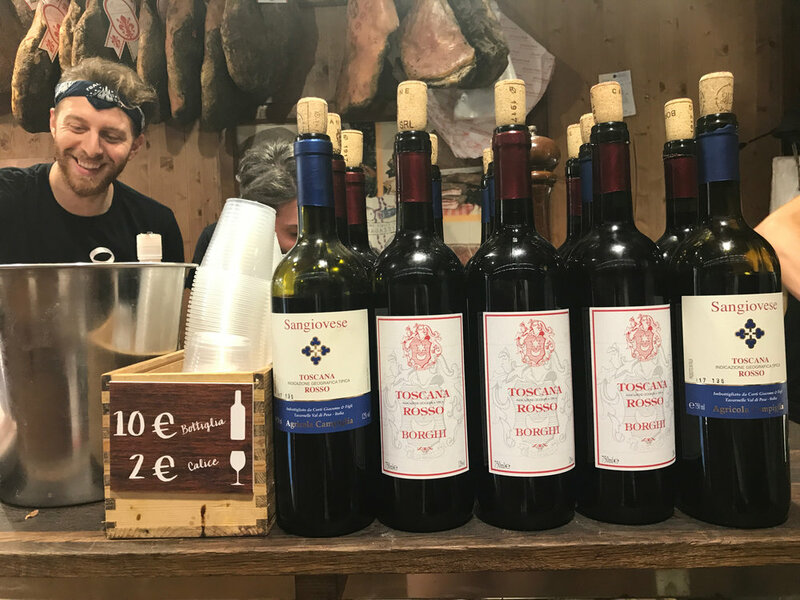 i repeat: you can get wine with your meal and can go drink it on the street. remind me again why i can't just live here? gusta is a small little pizzeria that feels totally authentic and unique despite getting some attention from the food network [insert eye roll here]. but well known or not, it's absolutely worth a trip. spicy salami and margherita...need i say more? OK, this dish wasn't from either of the places I mentioned but it was a gnocchi in a creamy gorgonzola sauce with truffles that I still can't get out of my head a year later. SERIOUSLY to die for. on our last night in florence, we stumbled upon every study abroad kid in the entire town, probably. we did as the youths did and grabbed some tabbachi bottles of beer, pringles and headed up to the piazza del michelangelo. after taking a scenic route thanks to someone's malfunctioning phone map (I won't name names), we arrived a sweaty, thirsty mess. nothing our refreshments couldn't solve though, because this was the view at sunset. it's not goodbye, florence. it's definitely see you later.